There's not much that goes together quite like Martin and live performance. With a huge selection of gorgeous guitars which are perfect for musicians on the road, the sublime natural sound of Martin's instruments have always made them a first choice for gigging guitarists. Known all over the planet for their distinctive tones, playability and incredible aesthetics, these guitars have well and truly made their mark on music history and rightfully so. Let's face it - if everyone from Johnny Cash to Kurt Cobain has played them, they must be something special! We have dedicated demo areas in several of our stores and have even visited the Martin factory in the past, witnessing first-hand the care and attention to detail that their builders put into each instrument. In fact, we are of the firm belief that every guitarist should experience playing a Martin at least once - so, we're pleased to share that the guys in Epsom are giving you the chance to do exactly that! 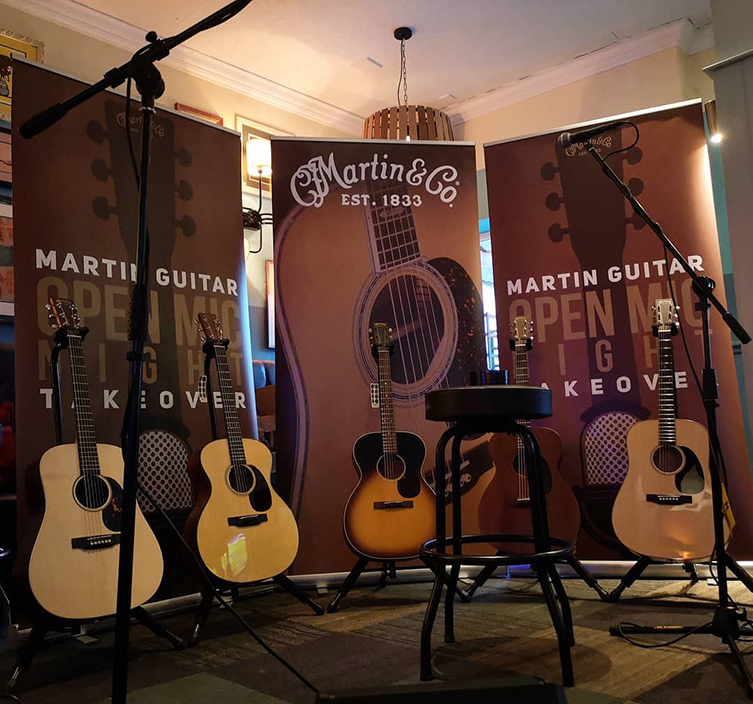 On March 5th (05/03/19, 7:00PM) our Epsom store's Open Mic Night is back and this time the guys have partnered up with Martin Guitar! That's right, our favourite showcase of local music has teamed up with one of the finest guitar manufacturers on the market and the result is going to sound seriously sweet. We'll be joined by Martin expert Greig Dunning and a selection of his favourite models which we'd encourage you to try out and get a feel for. It's not often you get the opportunity to demo a brand new guitar in a live environment, so if you've been thinking about upgrading your acoustic, we'd thoroughly recommend signing up! With free Martin goodies for everyone who plays and a laid back, friendly atmosphere where you can jam and hang out with like-minded musicians, this is a fantastic opportunity to play some music and get a feel for some new gear while you're at it. All performers are welcome to bring their own instruments along but if you fancy trying something different, Greig will be armed with a selection of his favourite Martin acoustics for you to perform with!